I agree, this could have been better if more was visible. The movie is also very oddly letterboxed on the DVD with the picture being at the top of the screen. I suspect it has been transferred from a Japanese VHS with someone putting a black box over the subtitles, thereby also cutting away a part of the image. The mastering problem with the really dark image might be a product of the same transfer or it might have been on the original VHS. On the other hand, it is a very realistic movie, because this is exactly what a gunfight at night in the forest looks like; everything is dark except for the occasional muzzle flashes. 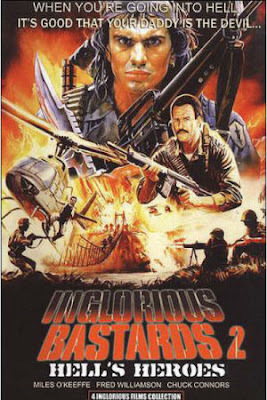 There is another similar DVD collection called Expendables 2: Zero Heroes, which has the original The Expendables (1988), Wild Team and both Cobra Mission movies. Yes we noticed we noticed the letterboxing was misaligned. Your explanation for why that is makes a lot of sense. We'll look for that other collection and thanks for the great info as always.